This time of year, pain de sucre is found in bins amid the winter varietal greens, spinach, the many strains of radicchio chicory, nestled between the squash and pumpkins. Tender looking elongated tightly packed loaves, in English called Sugarloaf Chicory, tumble gladly into my market basket. 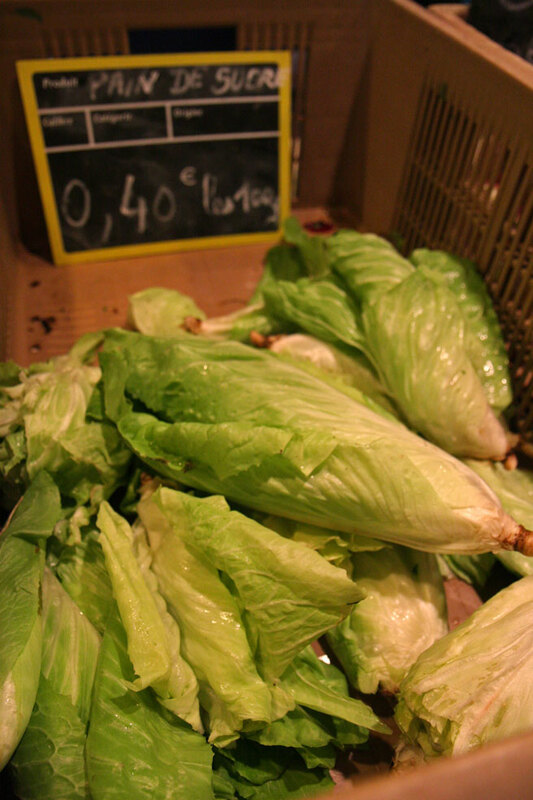 While it's still dark in the early evenings, I walk down to the Wednesday night market at Place Carnot where the local farmers come once a week and keep an eye out for it. I like to cook my pain de sucre by slicing it into chunks, rinsing the leaves, and lightly poaching them in a billowy herbal broth that's been simmered with a big winter bouquet and a ham bone. Chicory goes with pork. 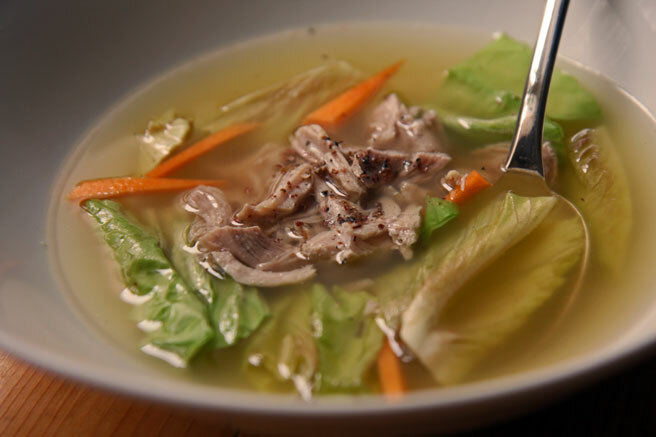 I float the poached leaves with the meat and herbs, sometimes adding wedges of pumpkin or topping the soup with shavings of good hard cheeses. A spritz of lemon juice, a drizzle of olive oil, and a grind of rose peppercorns or sichuan pepper acts like a little taste ladle that captures the bitter goodness and lifts it up for a second boost of winter satisfaction. Wrap yourself in a sweater, sip this soup in a chair by the window, slurp the bitter greens, and settle in for an afternoon soaking up some prose. It somehow seems like spring is around the corner this week. Yikes! When I saw this point, I was excited, since I thought you found a use (and a recipe) for the mound of solid sugar I was gifted a while back. Still, those greens look gorgeous. Lucy, a question: Do you have any idea why I can go a couple of weeks without seeing a new post on your blog, but then suddenly there will be three or four or five? Is it possibly because you "put up" several on one day that were actually composed over several days? Looks like such a satisfying soup. 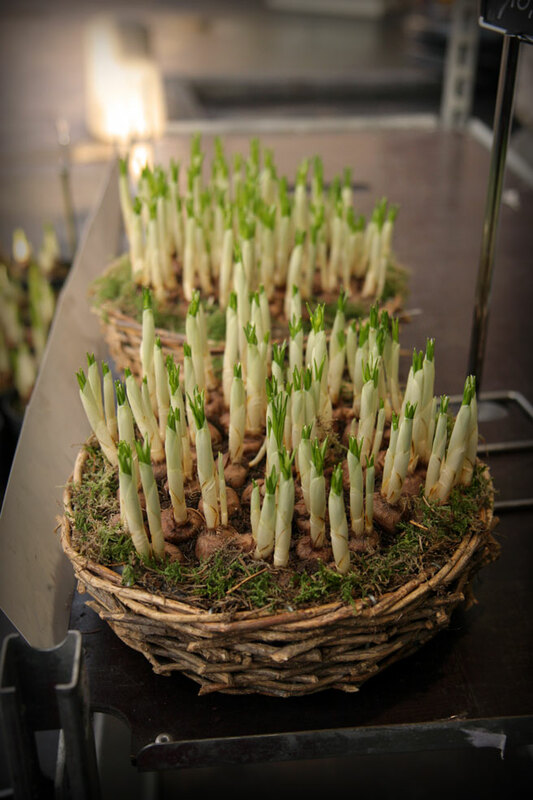 And seeing those bulbs sprouting gives me hope that maybe even here in Minnesota, spring is closer. David, thank you for your kind comment. Sorry I couldn't help you with your sugar problem! Your dressing looks delicious and I will definitely try it with this season's bitter greens. Hello Lori, you got it! I put 'em up when they're ready! Keep stopping by! Eileen, glad you like the soup. I have been happy with the clear soups these past few weeks. Your blog inspires genius. You make the most amazing dishes out of seemingly simple ingredients. The soup looks so good . . . and the bulbs in the baskets are so French. Spring is truly around the corner. I have never ever seen that here, I'll have to keep an eye out for it, greens-fiend that I am. I cannot say enough how marvelous your photography is... the markets, the scenery, the food! That cheese plate a while back had me longing for Europe and its much-less-restricted cheese sales laws, and I've had the herb/phyllo cracker recipe bookmarked for ages. It's a treat to stop by and read your posts! This is a beautiful recipe, and the way you write about it is even more lovely. I LOVE your photographs! I know the feeling you get when spring seems near. It is a false sense of exuberance, and I wish i knew what brings it on. Perhaps a simple shift in the angle of the sun at a certain time of day? Thank you for the charming New Year's wishes, Lucy! Thank you for the comments my friends! That looks perfect for this cold, gray day. I see this in the markets but didn't really know what to do with it. And all my cook books are still in boxes! it's a beautiful looking and sounding soup.